This app helps you focussing. If you want to do some concentrated work, than you start a session. From that moment the app starts to measure all kinds of stuff that are related to focussing. Of course it can not measure if you really are focussed, so it measures proxies. Things like noise and movement of your phone. 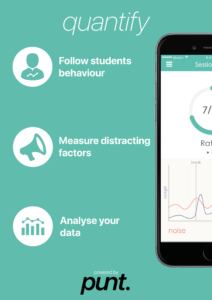 The app can measure the total time you spent on sessions and the quality of your sessions (in terms of breaks and distractions). The app reports this data back to you by using graphs. Quantified is a prototype app. Do you want to continue the work that is done. E-mail me at r.vandervorst(at)fontys.nl and I will sent you alle materials, design and code. We also have a student Applied Psychology that just started researching the relation between movement and focus. We will keep you posted about the results.